Yesterday’s lunar eclipse deepened the financial crisis within the Eurozone. The Moon signifies the common people so is it a mere coincidence that yesterday millions of Greek workers went on strike? The Moon eclipsed suggests fear and uncertainty among the people – and with the Moon in Sagittarius the expression of frustration made for a big show of feeling. However, the eclipse horoscope does not stand alone it is linked to other cycles, in this case particularly the cycle of the Moon’s Nodes. If we look – for example -at the lunar appulse eclipse of December 30th 2001 – which fell just a day before the introduction of the Euro on January 1st 2002 – we will see that the Moon’s Nodes mirror the Moon’s Nodes during yesterday’s lunar eclipse. (click to enlarge the image). Now what – you might ask yourself – does this mean? Well it certainly suggests -in my opinion – that the Euro currency itself has a relation to the Gemini/Sagittarius nodal axis. Gemini rules trading and Sagittarius is connected to foreign interest. It could also mean that the euro itself has a tie in to the Moon/Mercury cycle. Both the Moon and Mercury are fast moving planets – and the Euro has certainly proven itself to be a turbulent currency. The whole idea of the Euro was based on the abstract idea of one big European family (the Moon) and one of its key aims was to increase and simplify trade between member states. 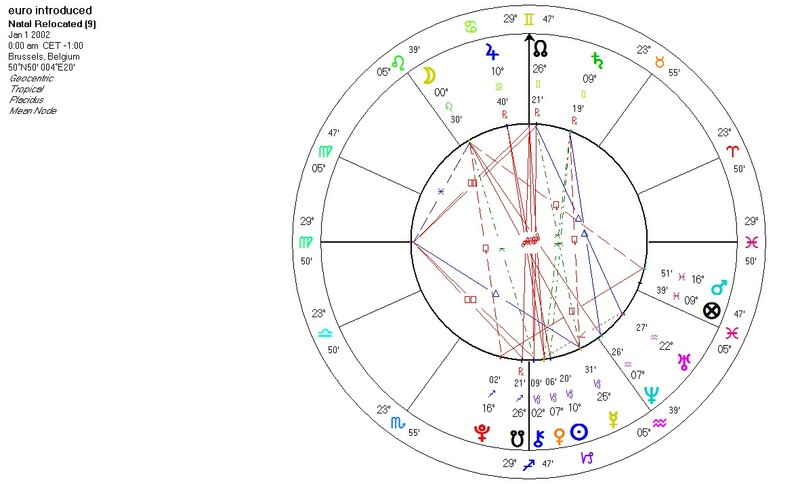 Jupiter is in Cancer (Moon ruled) in the 10th house of the introduction of the Euro horoscope (see horoscope below). Jupiter is exalted in Cancer – which with hindsight would seem to reflect over optimism coupled with an excessive confidence in the ability of the European community to share its resources, not only in good times – but also in bad. 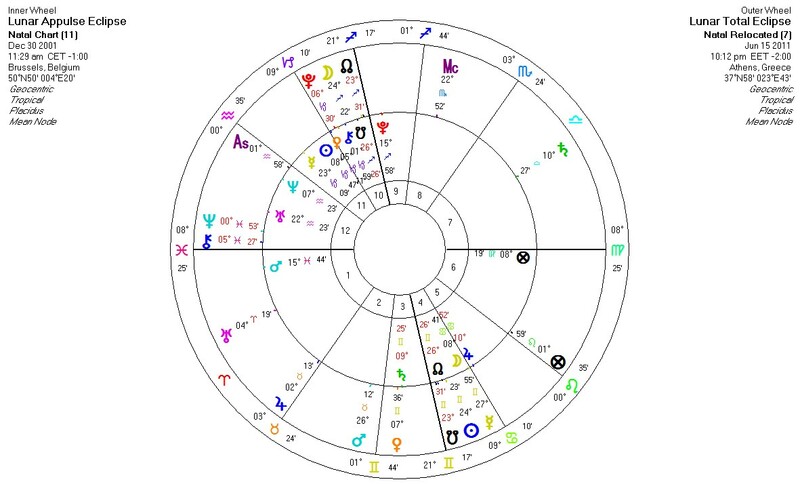 Of the two lunar eclipse horoscopes- instinctively I feel the eclipsed Cancer Moon in the pre Euro lunar eclipse horoscope is the more significant. The Moon is linked to identity and with the arrival of the euro for many the old safe, familiar, tried and trusted currency was lost and with it a part of the nation’s character. Interestingly the suggestion that Greece might re-introduce the Drachma has been circulating of late. 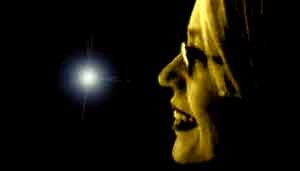 Dit bericht is geplaatst in Astrology English, business astrology, mundane astrologie. Bookmark de permalink.